19 But Joseph replied, “Don’t be afraid of me. Am I God, that I can punish you? 20 You intended to harm me, but God intended it all for good. He brought me to this position so I could save the lives of many people. Continuing on from last week, Joseph had another opportunity to get his brothers back. Pop was gone now. And his brothers knew it. So they fabricated a story that good ol’ dad had told them to tell Joseph that Joseph should forgive them. Yeah. I’m sure Joseph believed that one. Joseph had the power in that moment to really put the screws to them. But Joseph saw once again the reality of God’s purposes running so much deeper than his jealous brothers. Sometimes when people seek to harm us, they mistakenly think they have power while they themselves are being controlled by the evil one – doing his bidding. Joseph could have mistakenly thought he had power over his brothers to harm them, too. He knew better. He took the higher road and told them not to fear him. He knew his place. And he understood the purposes of God. Such higher understanding only comes from knowing God. 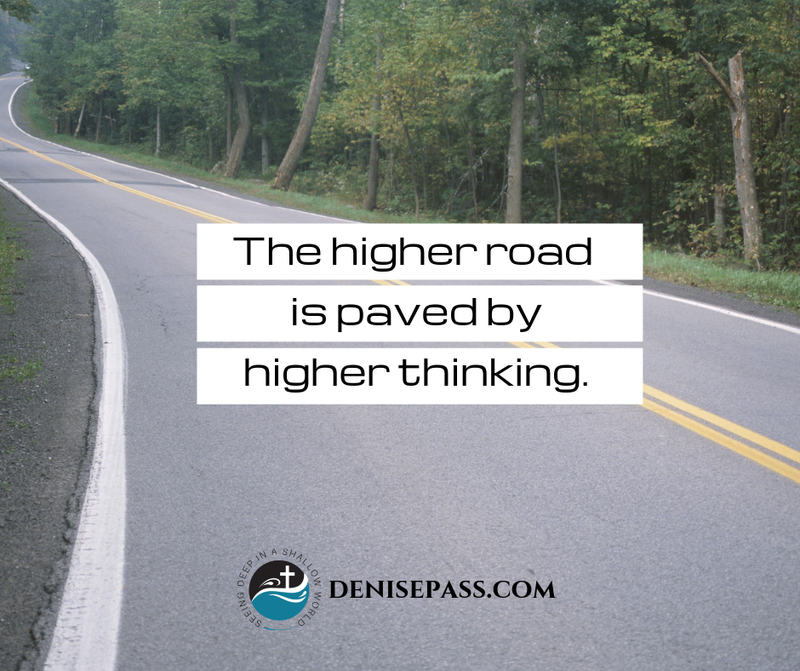 The higher road is paved by higher thinking that sees the purposes of our sovereign God supersede man’s striving. And God has our back. We don’t have to get involved in defending self or getting back at someone when we are unfairly treated. We don’t just live for the here and now. Any gain in this world could be a loss for eternity. And we are accountable to the One Who gave us life to live it well for His glory alone. We can take the higher road when we are mistreated, too, because we also have a God who rules over all of our circumstances. Our God sees. Even when it seems other people have power over us, their knees will also bow before God one day, too. And our God uses what was meant for evil and uses it for good every time.